Thank you to Professional Car Society members Bernie DeWinter and Barry Caselli for the information and to Devin Britton for the pictures below. The Commercial Chassis was the complete chassis and engine, and the front body (fenders, hood, cowl, and items which fit onto same) but it gets sticky from there. Other items that were part of the package were a pair of coupe quarter panels which were cut down by the coachbuilders to fit their bodies, a special rear bumper assembly, and that was about it in terms of major exterior items, though the instrument panel and steering wheel was part of the chassis package too. Small items like the vent window assemblies door handles and window cranks were part of the package, as were tail lights, but doors themselves were NOT. Even in the event of using vent window assemblies from Cadillac, there were discrepancies. 1959 thru 1964 Eurekas used a smaller passenger car vent window assembly, while the competition used the ones for the Fleetwood 75's, which shared the commercial windshield in those years. 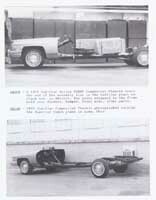 Pinner built some coaches on Cadillac commercial chassis between 1965 and 1970, but a photo of a 1968 model shows 1967 Chevy pickup truck vent windows, which were flat glass, along with all flat side glass, and the rear quarter windows were 1961 thru 1964 GM station wagon units. Naturally, items such as side moldings may have been stock Cadillac items in some cases, but they were probably modified to fit in terms of length because the doors and quarter panels were different in length from any stock Cadillac models. Outside mirrors were usually Cadillac items, too. Starting in 1977, with the downsizing of the commercial chassis, coachbuilders went to using stock Cadillac sedan front door shells in an effort to save tooling costs, but they seem to have used their own upper door frame assemblies and glass on those door shells. At the back of the Miller-Meteor plant in Piqua, would be the dies used to stamp the doors, along with dollies to roll the bodies around the plant. One of the dollies was actually a Cadillac hearse frame modified for that purpose, while the rest of them were made of boxed steel framework. Once the downsized models arrived, S&S seems to have used stock Cadillac sheet metal and side doors, because the lengths of those components were the same as those of a Cadillac limousine of the era. This would explain why S&S, which was known for its large doors, would suddenly get away from such convenience and practicality for the users of its products. Overall, coachbuilders seem to have had access to Cadillac's parts bins to some extent, using different stock Cadillac items at different times.